This Executive Order shall take effect immediately upon approval. Done in Miagao, Iloilo, Philippines this 16th day of July 2013. MACARIO N. NAPULAN, M. D.
To determine the gaps and submit reports on the compliance and implementation by the Local Government on the provisions of the above-mentioned Memorandum of Agreement (MOA). To identify land areas, material and human resources for potential development that will redound to welfare and progress of Miagao and UPV. To prepare recommendations and proposals to the Mayor relative to the status of Land acquisition and relocation of Informal Settlers. To propose joint undertakings and programs on Public Health, Marine, Fisheries, Environment, Food Technology and other areas that are commonly germane to UPV and LGU mandates, vision, mission and goals. To coordinate with the concerned Officials and Staff of UPV who may be designated and authorized by the Chancellor for the purpose. To submit to the Undersigned a Development Agenda/Framework and Project Leads/ Proposals not later than the end of September 2013, for consideration by both UPV and LGU. The TWG shall meet at least once a month and coordinate with the UPV Counterparts for the joint coordinative meetings. This Order shall take effect immediately until revoked. 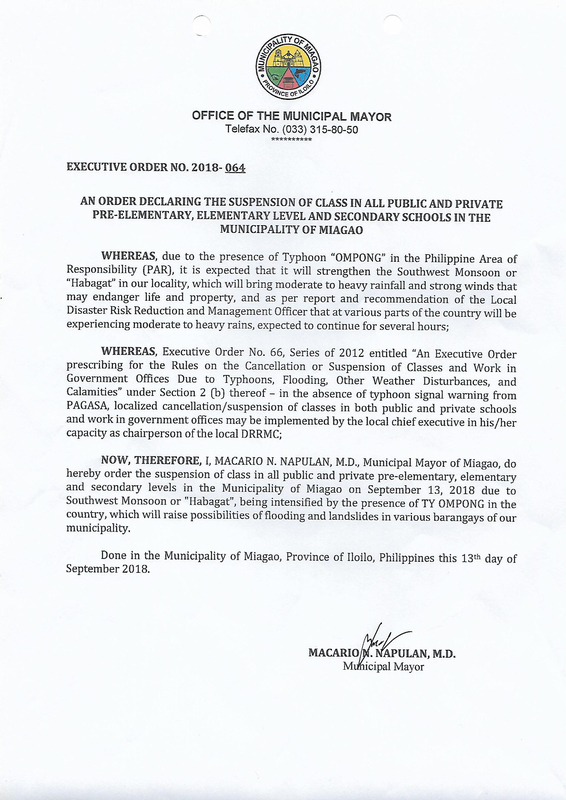 Done in the Municipality of Miagao, Iloilo this 12th day of August 2013. 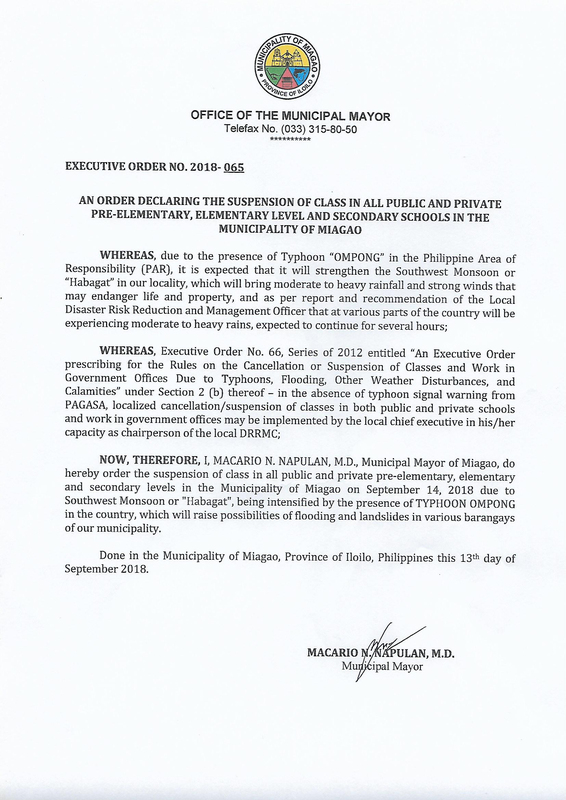 NOW THEREFORE, I, Macario N. Napulan, Municipal Mayor of the Municipality of Miagao, Iloilo, Philippines, by virtue of the power vested in me by law as the Local Chief Executive, do hereby create a special task force, prescribing its functions and schedule of meetings. The members of the said Task Force shall serve without compensation. FURTHERMORE, let copies of this Order be furnished to all concerned for their information and guidance. Done at Miagao, Iloilo, Philippines this 12th day of August 2013. Mr. LORETO NAGALLO, President, Federation of Market Vendors Assoc. Coordinates the efforts of its component barangays in the implementation of the Municipal Solid Waste Management Plan. The BOARD shall convene and formulate strategies for the effective local implementation of Republic Act No. 9003 and Memorandum circular Nos. 2001-19, 48 and 51 of the Department of Interior and Local Government. This Order shall take effect immediately and all previous issuances inconsistent hereof are hereby superseded/ revoked. Done in Miagao, Iloilo, Philippines this 8th day of August 2013.